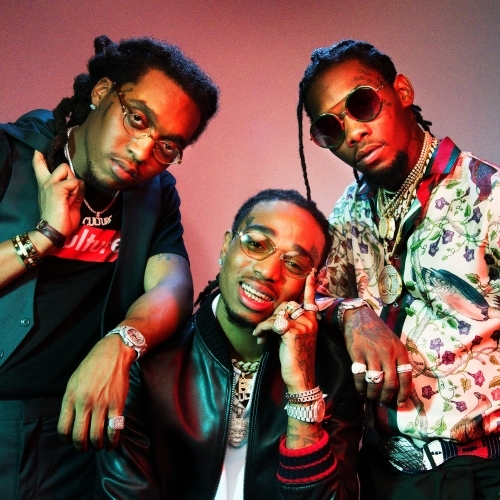 Migos is a rap trio-group from Lawrenceville, GA consisting of members Quavo (Quavious Marshall), Offset (Kiari Cephus) and Takeoff (Kirshnik Ball). Originally the group started as family, who all had an interest in music. It wasn't until 2008 that this trio took their talent seriously, and put together and released their first project "Juug Season" in 2011. T​he group later released another mixtape titled "No Label" in 2012, which featured "Bando", a track that was​ soon labeled a "dope-boy anthem". Fast forward to 2013, the trio have released their newest project "Young Rich Niggas", which many fans call the "Mixtape of the Summer". The mixtape featured guest verses from fellow Atlanta artists such as; Trinidad Jame$, Gucci Mane, Soulja Boy, Que and even RiFF RAFF, who is a Houston native. Due to their rapid unforeseen success, Migos have even received a guest verse from Young Money artist, Drake, on one of the mixtape's most infectious tracks "Versace". Migos have collaborated with the "Trap God" himself Gucci Mane and the "Street's Lottery" Young Scooter... not to mention, Migos have also received numerous co-signs from big names in the rap community such as DJ Drama, Juicy J, DJ Scream and Drake just to name a few.